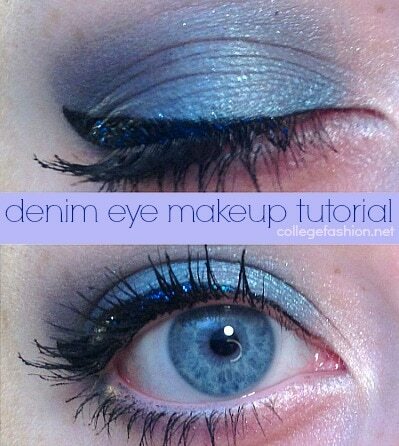 One of my favorite beauty trends this season is the denim-eye look. It’s all about using those blue satin and shimmery eye shadows to replicate a pair of your favorite skinny jeans, and today I’ve created a look that is definitely eye-catching and plays right into the trend. This look is so easy and also incredibly fun, and with its extra glittery liner this look is ideal for a night out with friends or even a fun date – the options are endless! 1) Prime your eyelids with NYX Jumbo Eye Pencil in Electric Blue. 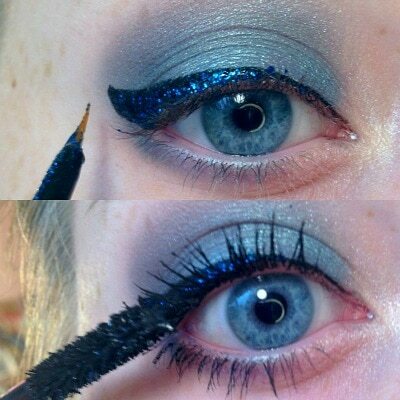 Just draw a line on your eyelid and blend out the color with your ring finger. The goal is to create a colored base to further enhance the blues that will go on the lids. 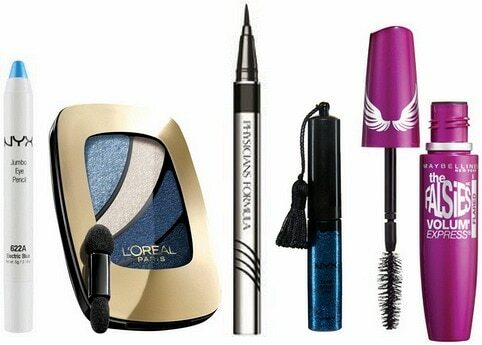 2) With a small eyeshadow brush, take the lightest blue in the palette and pack the color all over your eyelids. 3) With the next-darkest blue, take a small blending brush and blend the color into your crease using small, circular motions. 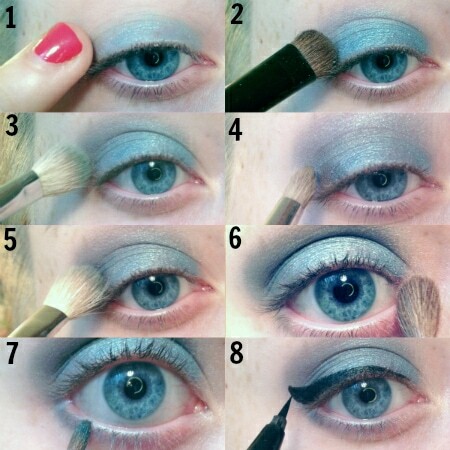 4) With a small pencil brush and the darkest blue shade, create a ‘V’ shape in the outer corner of your eyelids. 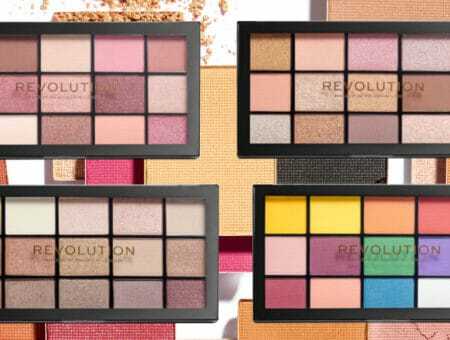 5) Taking the same small crease brush, blend the darkest color more into the crease, eliminating any harsh lines that were created when shaping the ‘V’ in the outer corners. 6) With the white shimmery color and an angled eyeshadow brush, apply the color on the brow bone as a highlight and in the inner corners to brighten up your eyes. 7) With a small liner brush and the medium darkest color, line your lower lashes to create a smoldering effect. 8) We’re done with the eyeshadow, time for eyeliner! Take your eyeliner and create a wing-shape to give the effect of bigger, fuller lashes, and bigger, brighter eyes. 9) This step is totally optional, but I wanted to give the look a little more flare and pop so I added some glitter liner to my eyeliner! 10) Apply a couple coats of your favorite mascara and you’re done! I really hope you guys enjoyed this tutorial! I absolutely love wearing fun colors and the fact that this is a trend just makes it that much more awesome. 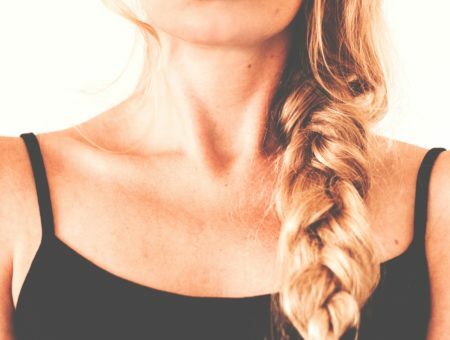 What do you guys think of the trend? 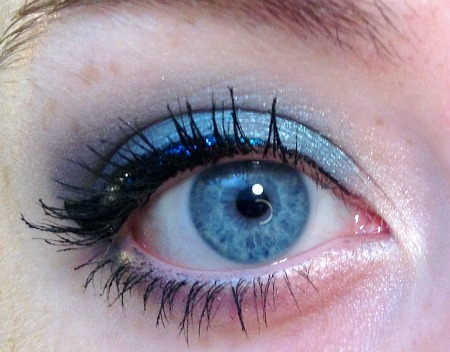 Would you ever wear blue eyeshadow? What’s the craziest smoldering eyeshadow look you’ve worn? Let me know your thoughts in the comments below!